MilSim West is a veteran owned and operated company, and is the United State’s premier war-gaming company. MilSim West presents THE CASPIAN BREAKOUT, October 20-22 at THE GOVERNMENT TRAINING INSTITUTE in Barnwell, SC. After NATO’s failed attempt to destroy the Caspian Gap a year ago, they laid siege to the city in the hopes of starving the defenders out. A year later, and against all odds, the Russian defenders are still entrenched in the city of Astrakhan desperately holding out. Recent victories on the Steppes and in Rostov have re-invigorated the beleaguered Russian military and they have begun planning a daring offensive to penetrate deep into enemy territory to save the Heroes of Astrakhan, and secure the Caspian region. As Russian forces prepare for The Caspian Breakout, NATO forces stand ready prepared for the second Battle of Astrakhan. Q. Can I bring my own POV and use it for my squad or platoon? Q. Will blank fire be allowed at this event? A. Yes, blank fire will be allowed for approved participants, 21 and over, who pass the blank fire inspection and safety test. If you are interested in running a blank fire weapon you must PM the MilSim West Facebook page for permission. It is the responsibility of the participant to make sure their firearm is in compliance with all relevant state and municipal laws. Q. Does the event actually start Friday? Can I show up Saturday? A. The event starts Friday, that means actual operations start Friday as well. Saturday check-in is highly discouraged and will be at our convenience. Plan on showing up Friday. Q. Will this be a 24-hour event? A. No, this is a 40 hour event. 40 hours continuous in the field, there will be rest breaks however you must be able to sustain yourself for 40 hours. Q. Can I go back to my car mid-game? Or can I sleep in a hotel? A. No. You will not only be missing out on an essential part of the experience, and much of the event, but you will also be damaging the immersion of the rest of the participants. Q. When does registration open and how much will it be? A. Registration will open Monday, May 15th and will be $150. After Monday, June 5th the price will increase to $175. Registering early will not only save you money, but also give MSW staff an idea of how many people are attending so they can properly plan and buy props. Q. Can I wait till the last moment to pay? A. Yes, you can wait till the last minute to pay, but we wouldn’t recommend it. Our previous event sold out before the close of registration leaving many who were planning on coming, but hadn’t registered yet, out in the cold. On top of that, there is a significant discount offered to those who register early (before June 5th). Q. When does registration close? A. Registration closes 2-weeks prior to the event, on October 6th. We would not recommend you wait that long as we expect this event to sell out before then. Q. Something came up and I can’t make the event. Can I get a refund or voucher for the next event? A. No, we have a strict no-refunds policy. If you are military we can transfer your ticket in the event that you are unable to make it, however we will no longer be accepting ticket transfers for any other reason. Q. What are the available sides at this event? A. There are two available sides and three factions. There is a multi-national NATO force on one side, then a combined Russian with Cossack militia on the other. A. Yes. This will be a perfect chance for people who want to play Russian, or with the Rushing Russians, but don’t have the kit required for Russian kits. Q. What are the uniform and/or kit restrictions? A. NATO is limited to Multicam; however, if you bring a squad of 9 or larger you can wear any NATO based camouflage you want – as long as it is not Russian or US M81 Woodland. You must PM us prior to the event if you plan on doing that. Russian forces are limited to Russian camouflage only. 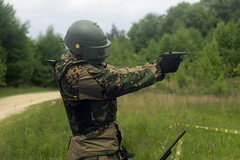 The Cossack Militia are limited to US M81 woodland and OD green so please no high speed fashion items. 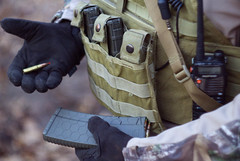 This is a militia unit, think surplus not Magpul. Q. What are the weapon restrictions? 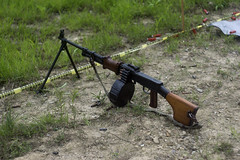 A. NATO is limited to US style weapons only (AR variant/SCAR/M249/M240/M60/M40/SR25/M14s). Russians are limited to Russian/Soviet weapons system (AK/SVD/PKM/RPK). Cossack Militia have no weapon restrictions but excessive attachments and optics are discouraged. Q. What airports are closest to the AO? A. 13-15 must have a parent or legal guardian as a registered participant as well as a notarized waiver. 16-17 only needs to sign the participant waiver and have your parents sign and notarize the Minor Participant Addendum to the waiver. 18+ are good to go. Q. What are the gear requirements?